One of the most awaited seasons is Autumn or weA�also call it as Fall. It is a season which is a transition from Summer to Winter. Autumn or fall also isA�when the daylight duration becomes shorter and the temperature cools down considerably. Fall comes between September to December, it is a nice season which can let us enjoy the activities inside the house because the temperature is low enough outside. It is better for us to stay at home. Fall living room design usually is still identical with the Halloween. Some of the homeowners even put the Halloween stuff in the living room to complete their Fall living room. It surely can make the living room looks awesome, but, not every fall features the Halloween accessories. To make yourself stay at home longer, making your home feel cozier to stay around is really important. 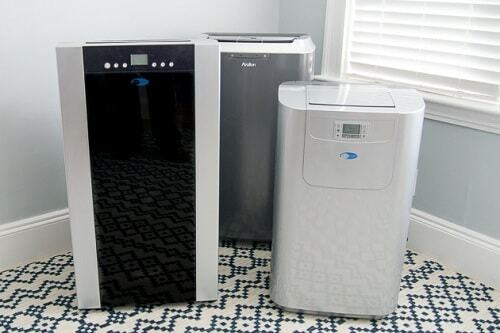 You should make your home much better, especially your living room. You can spend so many times in the living room, and if the living room you have is really cozy, you may not go out. 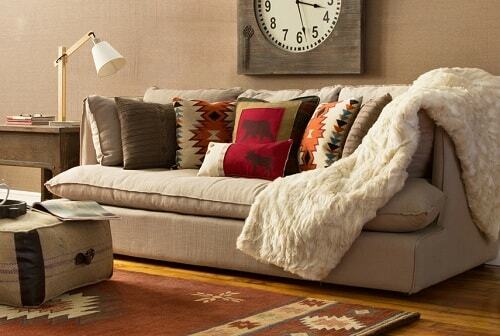 To make the living room cozier, you can decorate it well as you want. Then, let’s make our living room better and cozier now! Now you may need some references to make your living room cozier this Fall. So here we have summarized some of the inspiring living room ideas to try this Fall, these are the 15 inspiring fall living room decoration ideas that you can copy this year. One of the best fall living room idea is the one with Halloween nuance. 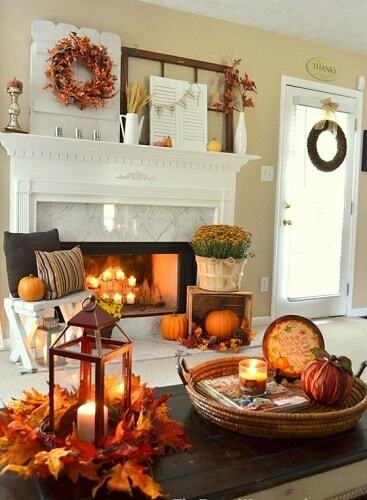 Here, some pumpkins are left scattered around the room which is nicely combined with the reddish autumn leaves. Then, the rattan baskets, wood pallet storage, and the wooden bucket give the nice vintage touch, supporting the pumpkin and leaves beautifully. Place the stuff near the fireplace and see the result, it is such a mesmerizingly warm decoration of the fall living room. You can also add the furnish to the wall and put a bit dry plant on the vase to make the Halloween nuance stronger. 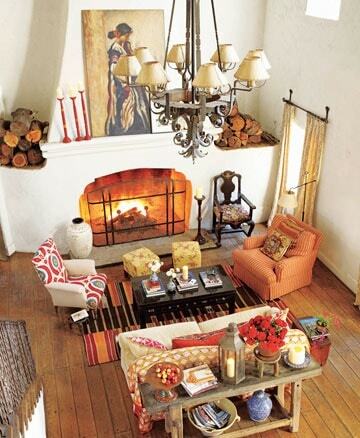 The living room looks amazing and it is a great idea to try this Fall. The Halloween stuff is completing the nuance inside. You can make this idea as the reference, look at the details of the living room. 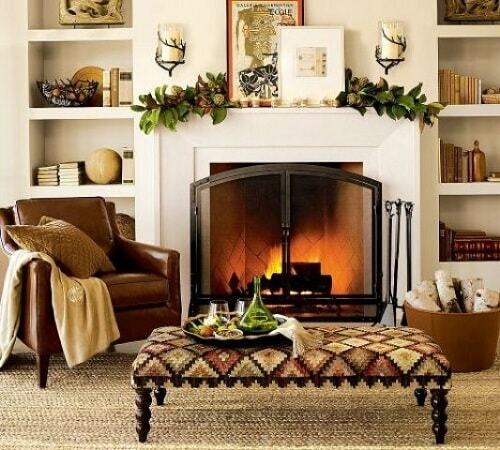 The second fall living room idea is a decorative one yet with a very calming atmosphere. The decorative armchairs, rugs, and tablecloth give a perfect ‘crowded’ accent to this earthy wooden living room. This living room idea adopts the rustic style which makes it look more natural and really cope with the nuance of the fall season. The arrangement of the furniture surely creates a beautiful harmony that makes the room still spacious with its decorative furniture. 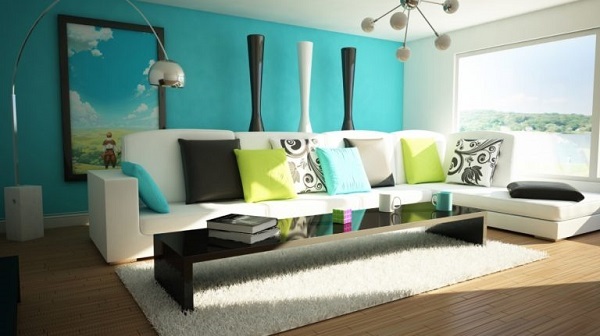 The color combination is also very smart in giving the warming touch to the whole room. You can also put a plant for the natural and fresh air around the living room. Such a cozy living room to have. Look at the decoration, it is so nice both in appearance and in the feels. Guess the atmosphere inside, it should be very warm and comfortable, we can spend the whole time in the living room like this. What a nice idea to try to apply. Almost every living room we summarize has the wooden floor, which is the indication that rustic decoration is still very popular up till today, so is this living room idea. It applies the wooden floor and features some rustic accessories, it also displays some natural stuff to enhance the feels. 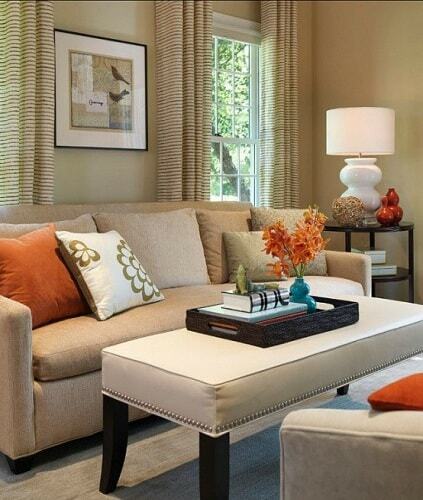 If you want to copy the details, you can add a white sofa, two chairs,A� one with the accent and one in orange. There are two ottomans in the front of the fireplace, it looks so warm. Above the fireplace, you can see some mini wood logs stacked beautifully. You can make this one as the reference if you want to celebrate your Halloween party. This living room has a simple decoration, the wall color is white, the furniture and the accessories match each other and creates a harmony inside. Try this idea to be your living room decoration for this Fall. 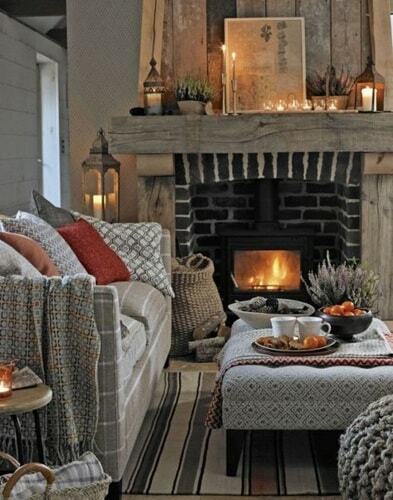 The beautiful living room in farmhouse style which is surely inspiring to try. The furniture and decoration create an ultimate relaxing feeling. There must be a unique idea among other ideas. Guess what unique in this idea? Yes, it is the fireplace. The fireplace position usually is on the bottom. 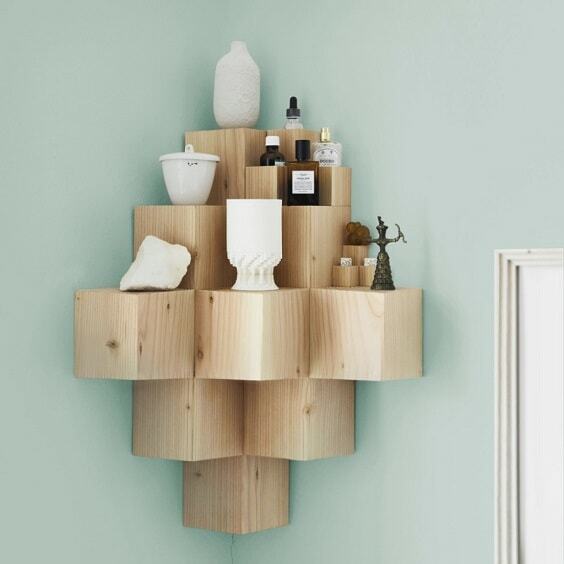 In this idea, you can see that the fireplace position is above the wood storage. The living room idea also applies the rustic style, anything inside looks so beautifully classic with wooden materials. Add the cream sofa with the beige leather cover, then put the wooden table and the chair with wood frame in classic style. The two tones flooring beautifully addsA�another style to the room which also separates the room with the dining room area. Then to complete the rustic style inside add some rustic accessories too for strengthening the nuance inside. Try this one as the new experience of having the different living room this fall! The living room is a flexible place for us to do many activities, one of the activities we do in the living room is relaxing. For such activity, we should have the comfortable living room. This idea shows the living room which is really comfortable and will make us feels better inside. It is a living room which is perfect both in looks and the quality. This kind of living room is very suitable for the Fall. The wall is covered with the accented wood sheet. Then the sofa accent and color really match the wood color. The orange chairs also look good inside. 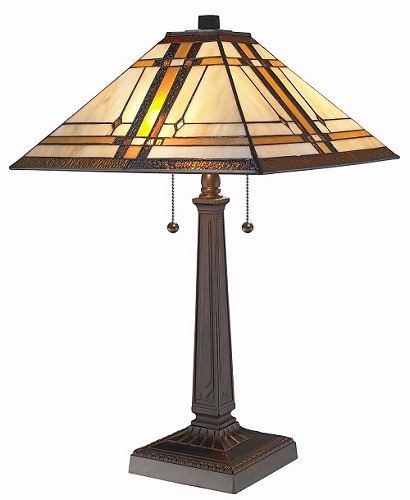 Then, there are some table lamps and the table is unique too. The flooring is really nice with natural accents. 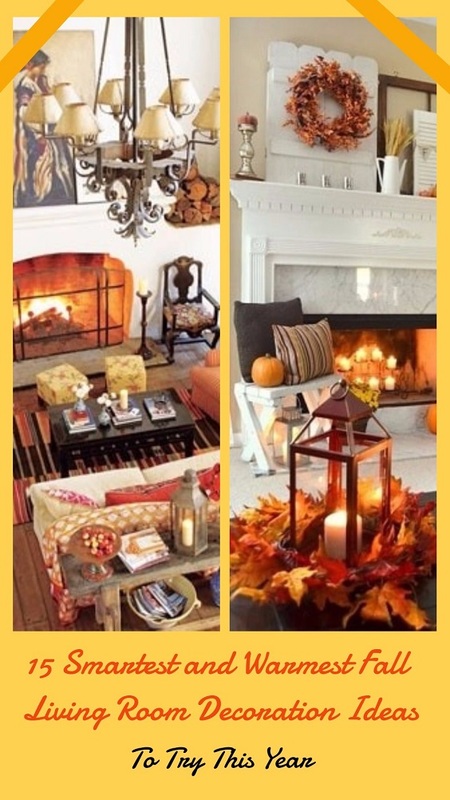 What a nice fall living room idea to try for the upcoming Fall this year! A simple thing is not always a low-quality one, it is also applicable to the living room. This living room idea is a simple one with a nice touch and warm atmosphere inside. Nothing better than the classic living room with the simple decoration. It is really cozy and suitable for us to have some activities here. The color, furniture, accessories, and the nuance really become one which are able to calm our mind even just by seeing it. If you intend to copy the idea and apply it to your living room you can add some furniture which can make the room cozier and the color can match with other stuff inside. 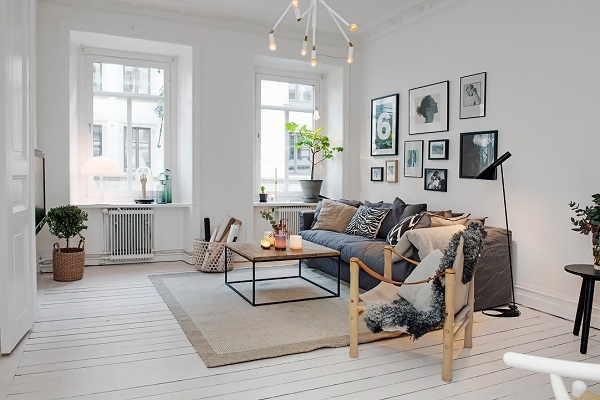 Here, you can see the cream sofa, two light brown chairs with wood base, two mini glass table, an accented rug, an ottoman with the same color with the sofa, and the other accessories. The flooring of the living room in the picture also the perfect choice which looks suitable for that kind of living room. Sure it will be a good idea make your living room like that for the upcoming Fall. Sitting near the fireplace is really the good activity in the Autumn. Decorating the living room to set the furniture near the fireplace is going to be a nice idea to do this time. Place the chair near the fireplace so we can sit and feel warm. The idea emphasizes the fireplace as the focal point with the greenery above it. It is aA� great concept of the fall living room idea. You can copy the idea if you want to make the living room like this. Decorating the furniture as the idea will make the living room cozier, especially for the upcoming Fall. 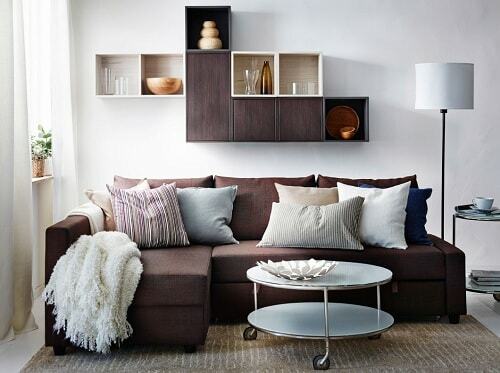 Try this idea for the warmer living room atmosphere and the minimalist looks. Get the best living room ever! Pumpkin is the symbol both for fall and the Halloween. Having pumpkin accessories to display in the living room for the upcoming fall is a must. Even it is only an accessory, a pumpkin can create the Halloween nuance around. The idea shows the simple living room decoration with an only pumpkin display. The pumpkin becomes a contrasting decor to this gray and white living room. Make your living room as simple as the idea. It is really simple, just a white sofa with pillows, a glass table and a large painting on the wall. How simple the idea is,A� but it is not a bad one to be the reference in improving the living room forA� the upcoming Fall. 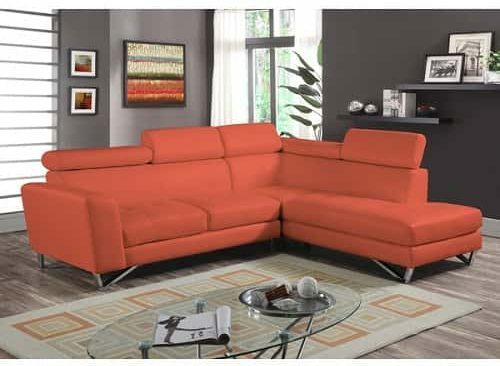 Orange is the a light color for the living room and making it have the cheerful atmosphere. The color is the symbol of Autumn too. You can make the living room as same with the idea picture which looks cheerful and warm at the same time. It is going to be a great idea to improve your living room as the picture this Fall. You can make your living room feels warmer than before with the light color which gives the cheerful atmosphere. For the details, you can add the dark cream sofa, orange chairs, the leather ottoman with tufted button design, the brown rug with the accent and you can add the vase with flowers too for the fresh looks. 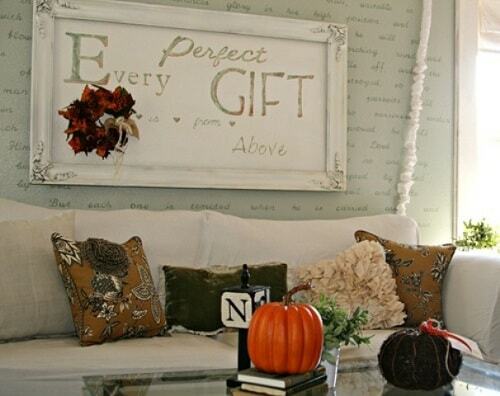 What a nice idea to try to apply to your lovely living room this Fall, isn’t it? Let’s make our living room cozier and we will get happier! The living room with the large window is always cool, especially with the natural outside views which can make us enjoy it exhilaratingly. This idea shows the living room with large windows with the nice outside views. Imagine we sit on the chair or laying on the sofa while staring at the falling leaves outside. It is so mesmerizing. 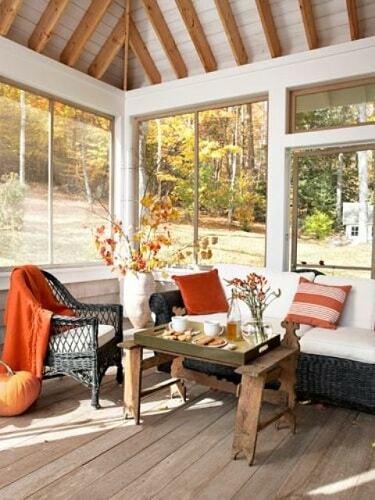 We can feel the nature while relaxing our body in the warm living room this Fall. What a nice idea to do. To improve the living room as in the picture, put the large window around the living room so we can see how beautiful nature is. You can add the sofa and the chair with the wooden mini table to enjoy the tea while seeing the nature. You can also put the vase with the plant to make the natural atmosphere around. Try this one forA� your living room new looks this Fall and enjoy the views! The plain living room isn’t always boring. Sometimes, it can be the good living room for spending the quality time with our family. The plain color living room can be a great one if we able to make it decorative and cozy. 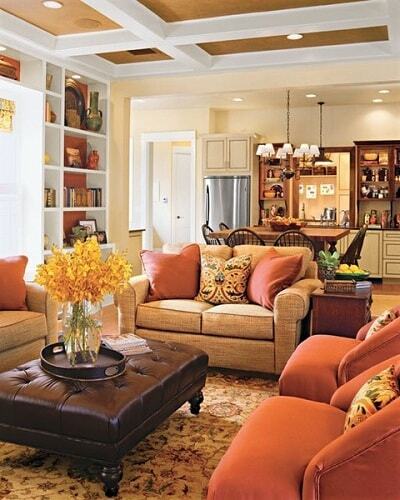 Look at this idea, it is a beige living room but we can still feel a warm atmosphere inside. The idea is suitable for the living room for this Fall. 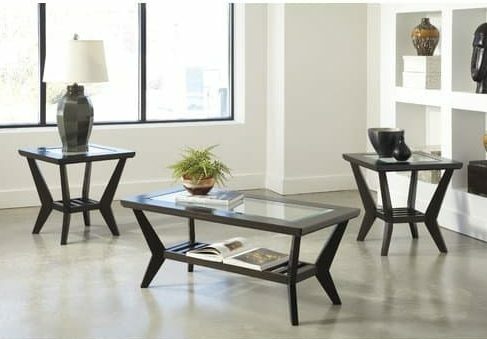 If you want to make it as your reference, you need the furniture which can make the plain color living room more living. The cream sofa and the cream table ottoman will be the great combination. Adding some accessories also can increase the nice looks of the living room such as a small vase and the table lamp. The curtains also can make it more decorative. Make the idea comes true and have the cozy living room. 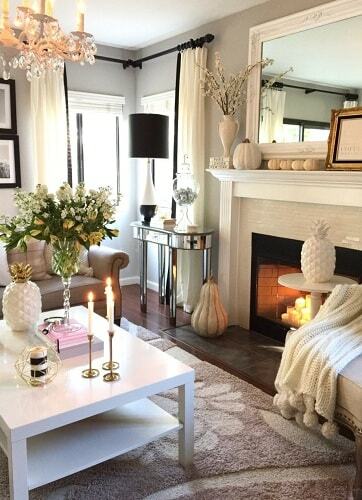 White and gray are always a great combination for you who love a neutral living room. 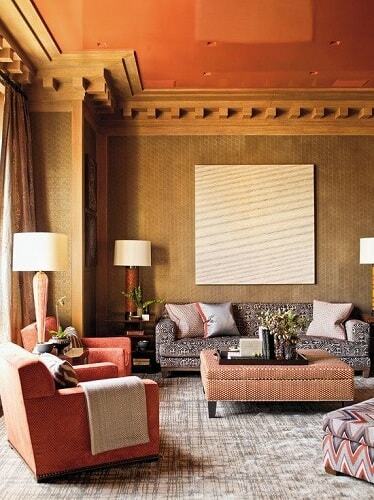 For this Fall, this neutral kind of living room is totally worth to try. This idea shows the living room with the nice decoration in white and gray. The living room also has the fireplace, not only to warm the temperature, but also adds another look t his neutral-colored living room. 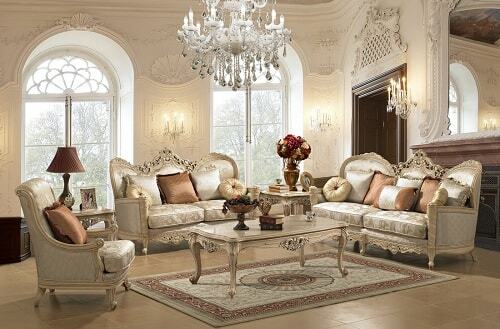 Decorate your living room as the idea and feel the different atmosphere of white. Copy the idea and the decoration of the picture. 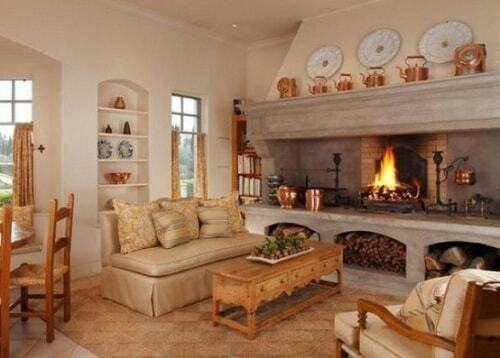 Add the white sofa, chairs, a table and set it near the fireplace so we can spend our time with our family in warmth. The accessories we put shout be the decorative too. Let’s have a better living room! 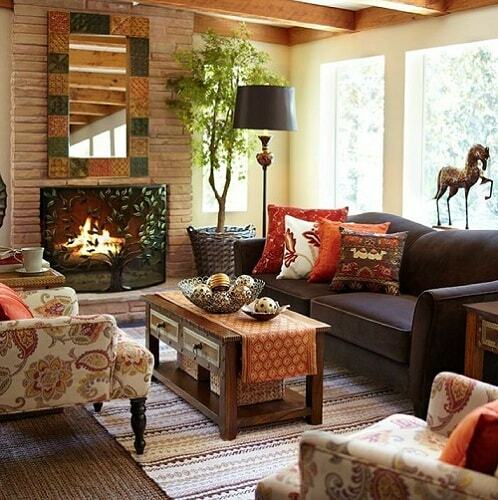 This Fall, the rustic style living room is appear to be popular among the others. So many homeowners apply the rustic style to their living room. Here, the darker rustic is chosen to give a warm and calming touch to the living room. The dimmed nuance around the room is surely suitable for you who love a cozy living roo to enjoy the feels of the fall. Try to make this kind of living room as the reference. 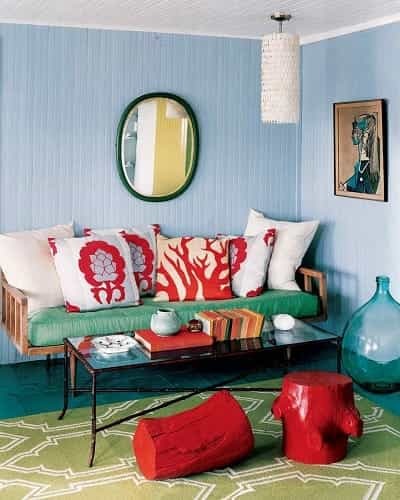 Add the sofa with warm color, the table covered in fabric, then the rug with the accent. The decoration is identical with wood. What a nice idea to apply for this Fall. In contrary with the precedingA�fall living room idea, this one is a bright beautiful living room with a gorgeous stylish decoration. The furniture and the accessories almost in white, the other color also supporting white and match with it. It is so beautiful to see this kind of living room. 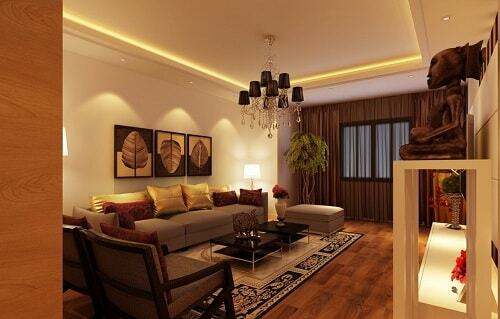 The living room applies the modern minimalist style which has a very mesmerizing atmosphere. The furniture you need for the idea is the white table, cream sofa, cream rug, and the wood flooring. Then there are many candles in the fireplace and some are on the table. Add some greenery for more natural touch inside. Try this idea for your living room this Fall! The last one is an idea of the white living room with simple decoration. It has the romantic touch as we can see the candle on the table. 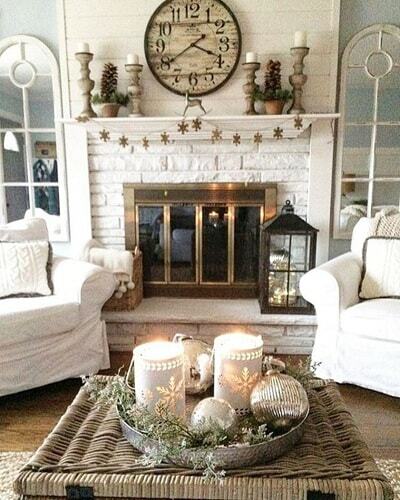 The living room is in the white rustic style which also kind of match with the winter nuance. The furniture you need for the idea is the chairs and the rattan table. 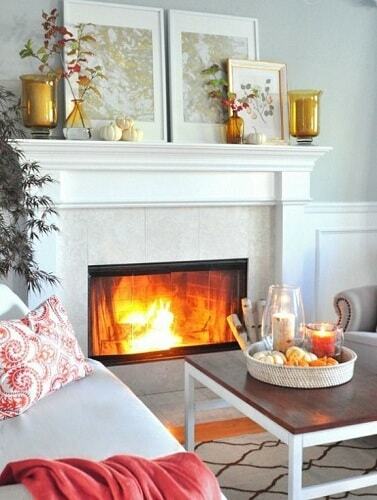 Put the furniture near the fireplace to feel the warmth. Make this one as your reference for your Fall living room improvement! Those are theA�15 Most Mesmerizing Fall Living Room Ideas To Try This Year for your living room improvement this fall. Make your living room a coziest place to spend the time and keep improve the living room. Then you will have the great place to spend the time with your lovely family. You also can relax your body and mind for a while especially for this Fall. Keep improving your living room!